Trip to Vietnam focuses all charms spread on the land of Vietnam in the form of beautiful landscape, vast beaches, colorful Vietnam culture, minority people and ancient towns. 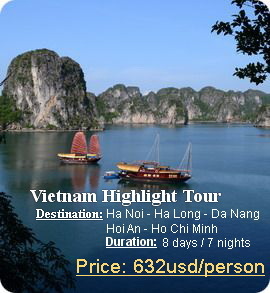 Vietnam tours package bring travelers very close to different impression of Vietnam country and the people. All World Heritage sites, recognized by UNESCO, makes your Vietnam tour memorable at our home country such as Ha Noi capital city, Sa Pa tour, Ha Long Bay tour, Phong Nha cave tour, Hue Old Capital city tour and Hoi An ancient town tour, world famous beach cities like Nha Trang beach, Ho Chi Minh ( Sai Gon ) city, Phu Quoc beach. River life in Mekong Delta is one of the typical cultural characters of Vietnam tourism with the variety of fruit gardens, Monkey Bridge, floating market, rice paddy fields and thousands of small channels… They depict the cultural and natural heritage of Vietnam. We welcome you with open heart to the trip with Eco Nature Travel Vietnam to explore hidden charm, cultural values and World Heritages sites that are our specialties which we bring to travelers at reasonable price and reliable quality services with cheap Vietnam tours package. Moreover, the customize tour in Vietnam is always welcomed at your request. You will have a well managed and wonderful trip with us, according to your wishes. You will feel warmth and enthusiasm in our staffs when you drop some lines or make request to Eco Nature Travel Vietnam. Sincere thanks from Eco Nature Travel Vietnam for choosing us as operator for your holiday in Vietnam.